Why am I not surprised that this guy is (or was) a Faux News anchor? I'm giving this guy two stars because he is able to put coherent sentences together. But otherwise, Bah humbug! I'll be honest, I see this as just a symptom of a bigger disease. My card-carrying ACLU member friends will never admit it, but there is an agenda to push God and all things Christian out of the public square. John Gibson just scratches the surface with a smattering of examples centered around Christmas. An important read in as much as it is a big piece of the puzzle. This is a great read (even for a bleeding-heart liberal like me). 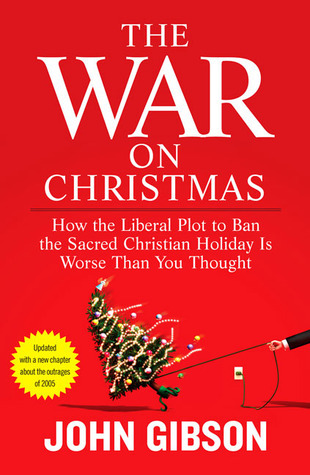 It is very thought-provoking, and caused me to question why Christian holidays are pushed into the closet while other religious and nonreligious holidays gain more recognition. A bit repetitive, but the overall premise of being sensitive to every other religion except Christianity rings true. Last two chapters were my favorite since they tended to tie the whole book together. Would love to see a follow up as to progress on one side or the other.